We asked Delia all sorts of Christmas questions that we thought you'd like the answers to. So, from storing mince pies to alternative marzipan and how she likes to spend the day, here's what Delia has to say. What's a good accompaniment for goose? When serving goose, accompany it with my prune and Armagnac sauce. However, simple apple sauce is brilliant as well. Can I use a frozen turkey? Yes, as long as you really give it enough time to defrost thoroughly. I think the best way is to defrost it in the fridge for 2 days, and leave it overnight in a cool place before cooking. Should goose be covered with foil to avoid it drying out? If goose dries out, this is probably due to overcooking, so rather than cover it with foil I would give it slightly less cooking time. 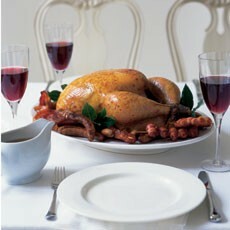 I like cold turkey with cold bread sauce and stuffing. One day we have it with sauté potatoes and the next with bubble and squeak. After that I make Turkey and Leek Flan, Turkey with a Hint of Thai and Curried Chicken Salad (made with turkey instead). What can I use instead of marzipan as I don’t like almonds? Try hazelnuts. I’ve never done it myself, but imagine it would be fine. How long does it take to cook and reheat individual Christmas puddings? Small puddings take 3 hours’ initial steaming, then 1 hour on Christmas Day. Can I microwave your Christmas pudding recipe to heat it up on the day? No, I think you should steam it then day before, then divide into portions. While you’re eating your main course, reheat it in a medium oven for 20-25 minutes, wrapped in foil. We always do this with leftover pudding on Boxing Day and it works a treat. I found a jar of last year’s mincemeat at the back of a cupboard. Will it still be edible? I imagine it will probably be even better than this year’s! How long should Christmas mincemeat be left to mature? It’s best eaten within a year of making, but actually you can make it the night before you need it. 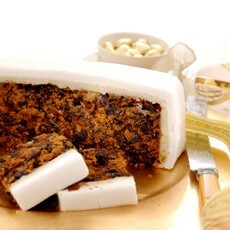 Can you ice a Christmas cake without using marzipan? Yes. If you paint the cake with apricot jam, you can use a fondant icing and just fix it on with the jam. Are any of your Christmas dessert recipes suitable for freezing? Yes – Chocolate Truffle Torte, Iced Christmas Pudding and Buche de Noel all freeze well. 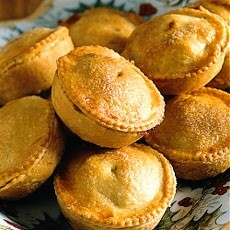 What’s the best way to store mince pies, in a tin or the freezer? I prefer to freeze them with the pastry raw, then cook them as and when I need them. Or you could cook them completely and freeze them, then defrost and warm through. Can your Christmas cake be adapted to fit a 6 inch square tin? Yes, this will work if you use half quantities – works brilliantly with the Creole Christmas Cake. You need to cook it at 140 C (gas mark 1) for 2 hours. What would you serve for a Christmas cheeseboard? I don’t want to make a large Christmas pudding, so what can I do? I usually make the full-size one, then wrap any leftovers in foil to be reheated in the oven on other days. Do you have a special Christmas breakfast or brunch? In our house we just save ourselves for Christmas lunch at 1pm. 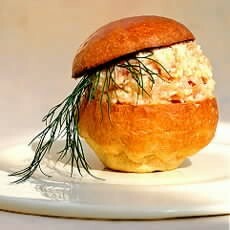 I think a special breakfast or brunch would be Brioche with Smoked Salmon and Scrambled Eggs.